If you haven’t done so already you can read Part 1 of this article here. The second time I was mugged left me a lot more shaken up than the first time for reasons which I’ll explain a little later. It was a Thursday night and almost every Thursday I go to a salsa bar near my house called “Tin Tin Deo” which is a bit of a salsa institution here in Cali. It is located on the one of the main transport arteries through the city, La 5 and about 2 km south of my house. I can walk there in less than 20 minutes but I normally go by bicycle because it’s much faster (and because I hate walking). I have never seen someone else go by bicycle, ever. That week I had a couchsurfer staying with me and she wanted to experience some real Colombian salsa so I brought her along. We went together on my bike, again because it’s faster and because it’s fun with two people on one bike. I’ve done it many times before with other friends. We had a great night of dancing and the club closed at 1am ( as it was Thursday). There is usually a very big group of people standing outside the club at that stage, chatting, waiting on taxis (of which there are plenty) etc. We said goodbye to our friends and hopped on my bike and I started pedaling up the street. Literally seconds later I heard a moto (a scooter) slowly coming up behind me and I heard the driver start to say something. Now, this has happened many times before when I’ve had someone else on my bike with me. Usually people find it funny and say some some sort of a joke about it. So it was natural that I thought that this was what the driver that night was going to say, so I started smiling and turned my head to the left to look at him. It was at this stage that I actually “heard” what he was saying. I missed the first part but I heard him say “We want your money and your cellphones. Stop the bike”. I looked around and realized that we were surrounded by 3 motos on our left; one belonging to the guy who spoke to us, one a little bit in front of us with another male rider and one a little further to the left with a male and female riding it together. For some reason seeing woman riding the other moto phased me a little, it made the situation a little harder to accept (I don’t know why, but it did). The guy continued to say “stop the bike, stop the bike, stop the bike” each time his voice getting more and more frustrated/angry. So what was my reaction? I kept pedaling. I was mentally frozen with shock and felt unable to do anything else. I had noticed that he hadn’t shown a gun which meant he “probably” didn’t have one because in the situation we were in it would have been to his advantage to show it. I knew that if I stopped they’d have us so I kept pedaling until I could think of something. It sounds like I was thinking logically but that couldn’t have been further from the truth. I was reacting and my reaction was for my body to continue doing what it was doing; pedal. Up ahead on the right was a small dark side street (so dark in fact that a little salsa club there is called “El Escondite” (the hiding place)). I could see that the guy on the moto in front was trying to divert us down there by blocking the way ahead of us. All I could think was that if they got us down there they could do whatever they wanted with us and no one would see anything and I didn’t like the thought of that. I sped up and managed to avoid the side street and pull in front of the guy trying to divert us. I still don’t know how I managed to do it with someone else sitting on the back of my bike (the guy in front must have been totally incompetent). Suddenly, the speaker ( who I assumed was the leader) shouted something and all 3 motos accelerated and took off ahead of us. I stopped the bike and shouted at my passenger to get off and run back the direction we came from, to Tin Tin Deo (this whole incident happened in the space of between 10 and 15 seconds so we were still very close to the club. I stayed where I was, straddling my bike, filled with more adrenalin and fear than I have ever felt in my life. My eyes were fixed on the 3 motos driving into the distance. I wanted to see what direction they were doing and wanted to make sure they didn’t turn around and come back at us again. When I saw them round a corner and felt (somewhat) confident they weren’t coming back I turned around and saw my couchsurfer friend not far behind looking at me. She was scared and confused (although I think I was more so). She told me how she initially thought they were friends of mine pulling up alongside us, just as I had done. We continued to walk up the street to where I knew there was a CAI (a mini police station/police box) and I told the cop on duty what had happened. It was at that point that I realized that I hadn’t taken note of any of the license plates on the motos. In Colombia, if you drive a motorbike or scooter you also have to wear a luminous vest with the license plate number printed on it but I hadn’t even noticed it. Everything happened so fast that I didn’t even think of noting their license plate numbers (I’m not even sure I’d have been able to remember it with that amount of adrenalin flowing through my veins). The cop said that I should have noted the plate number and I promised him I’d do it the next time it happened. We chuckled (which made me feel a bit better) and then we returned to my apartment. I was pretty shaken that night and somewhat the next day too. But the important thing was that we were both ok and they hadn’t taken anything from us. This, unlike my first mugging in January, was not simply a crime of opportunity. The 4 people on their 3 motos had clearly been waiting outside or near the club. Waiting for the right target to make its move. Unfortunately, that target was us. We were two obvious foreigners (the fair hair and light skin is a dead giveaway) and a lot of Colombians tend to associate foreigners with money. We were traveling alone on a slow moving bike when there were no other vehicles on the road. Even though I didn’t have a bag with me, my friend was carrying a small handbag which would be another attraction. We were sitting ducks. This time, I most certainly did not take the right course of action. Fair enough, we got away with absolutely no harm but only because we were very, very lucky. I should have stopped the bike as soon as they demanded it and given them everything that we had. We were outnumbered and alone at night, they could have done anything to us. My only defense is that what I did was simply a reaction and I didn’t consciously decide to defy our assailants. I was in shock and my body just reacted and kept pedaling. Even though we were both ok, I feel terrible for what happened (or for what could have happened). My actions put someone else in danger and that’s what shook me up so badly. It was my decision to cycle home together at that hour of the night (although I had done it many times before). If anything had happened to my friend I would never have forgiven myself. Why did they just speed up and disappear? To tell you the truth, I just don’t know for sure. All I can say is that we were very lucky that they did. The only possible reason is that the whole incident took longer than they had planned on due to my refusing to stop the bike. They took the opportunity to rob us when they did because there were no other cars on the road at the time. I assume they felt that they had run out of time and that another car could have come up the road at any second. On top of that, I think that when I avoided the side street they tried to divert us down I basically robbed them of their best chance at getting us completely alone. Once that chance was gone they cut their losses and took off. At least that’s what I assume! How I’m dealing with this now? I don’t take my mobile phone with me when I go to Tin Tin Deo (TTD) anymore. I don’t need it because I know my friends will be there when or a little after I arrive and if I need to note someone’s phone number I can just write it down. I only take enough cash to cover the entrance fee to the club. I don’t drink alcohol or soft drinks and waters free to I don’t need anymore. I am planning on buying a dummy phone. I can just buy a small, cheap, second hand phone and hand it to a thief if it ever happens again in the future. It probably would assuage them better than if I tell them that I have nothing to give them. If I ever travel with someone to TTD again, I’m going to go by taxi. It’s a hell of a lot safer. If I walk back home I’ll do it in a group (luckily some of my dance friends live really close to me which makes this possible). I used to take my laptop with me when I taught English classes in the evenings (I travel to my classes by bike). Obviously that has stopped! This whole incident shook me up a lot and has really made me feel uneasy at night in Cali. I noticed this about a week later when I walked to a different club, at night, by myself (it’s ok, you can call me an idiot for doing it. I am). I kind of wanted to prove to myself that I could do it and while I went and came back safely, the whole time I was on the street I felt like something bad was going to happen. I was physically profiling every group of people I passed on the street and my body tensed whenever they got near. That’s not a good way to feel about the city you live in. I even thought twice about taking my bike to TTD the next time I went, 2 weeks later. However I decided to follow the advice of my friend Tyler who lives in the same neighbourhood as me and shares some of my concerns for safety. I now cycle home in the Mio (bus) lane which is physically separated from the rest of the road with a small raised barrier (just big enough to keep cars and motos out). It’s well lit, provides a good view of my surroundings and the Mio doesn’t run that late at night so it’s all mine. Thankfully I feel much better now but the incident has made me much more conscious of taking care of myself in Cali. I do a lot of things which I wouldn’t consider to be the safest of options, just for the sake of convenience. This is downright stupid so I’m going to recommend some things that I may not actually always do myself but I think anyone concerned for there safety should. Underneath are a few general safety tips which I recommend anyone follow when traveling in a place where security is a little bit dodgy. Travel in groups, especially at night. Muggers are much more likely to pick on people who are alone. Ask locals where is safe and where isn’t, they know best. Also ask them the safest routes to get from one place to another. “Don’t give papaya”. This is a Colombian saying that means don’t give someone a reason to rob you. Don’t wear fancy jewelery on the street, don’t walk around with a big fancy camera hung around your neck etc. Don’t carry valuable objects in back pockets as these are much easier to pick-pocket. Tighter side pockets are better. 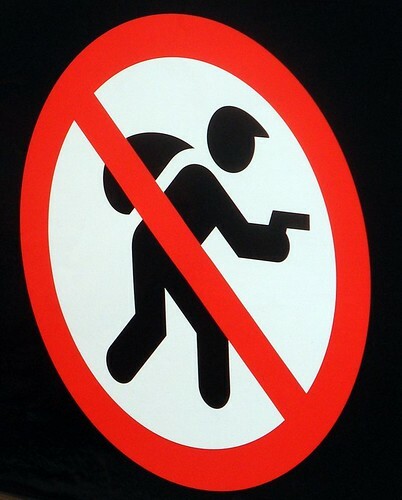 Better yet, don’t carry valuable objects. Don’t carry credit or ATM cards if you don’t need them. This gives muggers a reason to take you captive and clean out your accounts at a number of different ATMs. Call taxis from reputable companies to come pick you up. Here in Colombia this is considered much safer than hailing a taxi on the street. If you do get mugged, and there is no one around to help just hand over everything you have and don’t give the mugger a reason to hurt you. Carry a cheap, crappy cell phone to handover straight away if you do get mugged. Don’t look a mugger in the face. This seems to give them a reason to hurt you as you would be able to identify them to police. As I’ve already said, I don’t mean to destroy the image of Colombia or Cali but you really do need to be careful here and I’d prefer you were a little scared and cautious here than being completely oblivious and careless. If you know the risks you have a much better chance of avoiding them. Let me know if you think I should add anything else to this list, I’m sure there’s plenty I haven’t thought of. Stay safe and keep dancing.